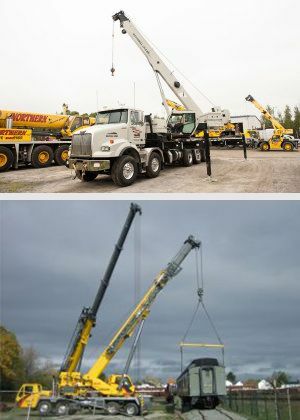 Need Crane Rentals in Sudbury? Call Northern Equipment & Crane Rentals Today! Want more information? Don’t hesitate to contact us at your earliest convenience! Want to learn more about the cranes available for rent from Northern Equipment & Crane Rentals? Check out the table on this page for in-depth information about some of the cranes we have available. Please note that we have several of the units on this page available locally for rent, but are not limited to the list as our fleet is always changing in order to better serve our customers. We also have plenty of attachments and accessories for cranes including concrete buckets, manbaskets, lifting beams, tractors and floats. Have questions? Call us toll free at 1-800-265-5481. For more information about the different types of cranes and boom trucks available, check out these manufacturer brochures.